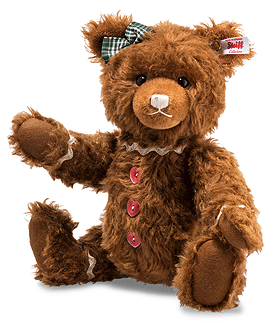 Ginger Bread Teddy Bear by Steiff. A sweet limited edition Steiff item. She is hand made in russet mohair with all the sweet trimmings. “Ginger, honey, sugar, lemon juice, …” Whenever Ginger Bread is asked for the recipe for her tangy Christmas cookies, she never reveals it entirely but smiles her sweetest smile instead. Adorned with glossy rick rack trim, heart-shaped mother-of-pearl buttons and a checked bow, our plump little baker somehow calls to mind a gingerbread woman. Coincidence?